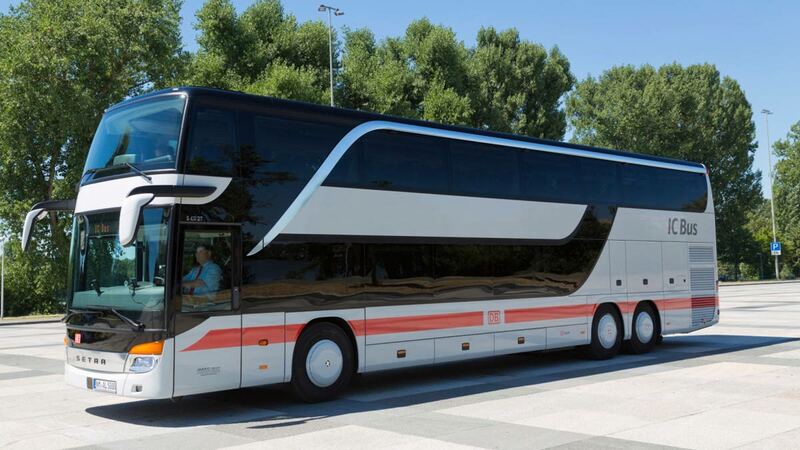 Cheap luxury intercity IC buses operated by German Railways / Deutsche Bahn connect Düsseldorf Hauptbahnhof with Antwerp, Eindhoven, Roermond, and on some weekends, London. The IC Bus offers a faster, cheaper and more convenient alternative than the train. The IC Bus runs four times per day with savings tickets between Düsseldorf and Eindhoven or Eindhoven and Antwerpen as cheap as €9. Düsseldorf to Antwerpen cost from €14. The weekend bus to London can be as cheap as €29 from Düsseldorf. All regular German Railways savings and free child travel are applied. The IC Bus operated by German Railways connects Düsseldorf in Germany with Antwerpen in Belgium four times per day. All buses stop en route in Eindhoven in The Netherlands with two buses in each direction also stop in Roermond. One bus per day continue to Lille via Ghent and on some weekends, one bus continue all the way to London. The IC Bus offers good value and time savings also for travel between the cities en route. However, it is not possible to buy tickets for transportation between Eindhoven and Roermond or Antwerpen and Gent. Intercity bus travel in Germany is booming. The market for long-distance bus travel has only been liberalized since early 2013 with new bus routes being launched almost weekly. The luxury IC Bus is German Railways answer to the challenge. The usually double-decker buses offer comfortable seats, ample legroom, free wifi and seat guarantees. Small snacks are available on the buses. Currently, IC Bus prices are remarkably low for a product offered by Deutsche Bahn, which long have treated annual price raises as an inalienable right. While many long-distance bus companies such as Flixbus is competing head-on with German Railways trains on price (but not traveling time) between major German cities, IC buses mostly run on routes not well served by existing railways. On the Düsseldorf – Roermond – Eindhoven – Antwerp route the bus can compete with the train on both time and price. Tickets for IC Buses can be bought from any outlet selling normal German Railways (DB) tickets including online, from station ticket machines or (more expensively) from ticket windows. All regular long-distance railway discounts may also be applied to IC Bus travel including Bahn Card savings and free travel for children under 15 when traveling with parents. The child must be added at time of reservation. Seat reservations are obligatory on IC buses and are included in quoted prices. Rail pass holders (Eurail, German Rail Pass, etc.) must make separate reservations to travel on IC buses but the fare is usually covered. Train connections between Düsseldorf and Antwerp are not particularly convenient. Train changes are required – usually in both Cologne (Köln) and Brussels. These detours are not only time consuming but also add significantly to travel costs. Train journeys from Düsseldorf to Antwerp can be as fast as 3h15 but traveling times around four hours are more likely. Many travelers may find it worth planning journeys around the three daily IC bus connections that take just less than three hours for the journey from Düsseldorf Hauptbahnhof and Antwerpen Centraal. The IC bus is not only faster than the trains between Düsseldorf and Antwerp but significantly cheaper too. The full-fare ticket for the IC Bus is currently €45 while for the train prices are around €65 (route and train dependent). All regular Deutsche Bahn savings fares such as Bahn Card reductions may be applied to both rail and bus fares. More interesting is the IC Bus special saving fares, which are currently only €14 for one-way tickets. Special deals are less often available on the train, as cross-border fares apply. Timetables for train and bus travel at Deutsche Bahn: Düsseldorf to Antwerp / Antwerp to Düsseldorf. Useful Deutsche Bahn website destination short cuts: D defaults to Düsseldorf Hauptbahnhof, DUS to Düsseldorf Airport station. The IC Bus from Düsseldorf to Eindhoven also offers a time saving over the trains running on this route. The bus takes only 1h30 while the trains take just over two hours with a train change required in Venlo. Full-fare on the Düsseldorf-Eindhoven route is slightly cheaper on the trains than on the bus: around €23 vs. €27 but savings fares as low as €9 are easy to get at the moment on the IC bus. Timetables for train and bus travel at Deutsche Bahn: Düsseldorf to Eindhoven / Eindhoven to Düsseldorf. On the journey from Düsseldorf to Roermond in The Netherlands it is no contest – the IC Bus wins clearly on time and convenience over the train. The direct IC Bus takes only 50 minutes – the train requires 1h40 with a change in Venlo. The full-fare bus ticket is at €18.50 two euro more expensive than the train but the bus ticket is often as cheap as €9. The train is available almost hourly but it may be more sensible to plan journeys around the bus times. Similarly, on the Antwerpen to Roermond route the IC Bus is far more convenient than the trains. Trains are generally half an hour slower than the bus and required one to three transfers. In Roermond, the IC Bus stops at the McArthur Glen Designer Outlet Roermond shopping mall. IC Bus and train timetables on Deutsche Bahn: Düsseldorf to Roermond / Roermond to Düsseldorf. The IC Bus is also a very useful alternative when traveling between Eindhoven or Roermond in The Netherlands and Antwerpen in Belgium. Daily, four IC buses connect Antwerp and Eindhoven in each direction. Traveling time is 1h15 vs. at least two hours by train with one or two transfers. The saving fares on the IC Bus are €9 or around €16 for full-fare tickets. Tickets are not sold for transportation between Roermond and Eindhoven. On some weekends and holiday periods, especially over Christmas and New Year, the IC Bus also offers a service to London. The last bus on some Thursdays, Fridays, and Saturdays continue to London to arrive at London’s Victoria Coach Station around 7 am the following morning. The return buses are on Friday, Saturday and Sunday nights. The traveling time of the IC Bus to London is around 10 hours and thus around three hours slower than the fastest train connections. However, the price can be as cheap as €29, or around a third of the cheapest train tickets. Timetables for train and bus travel at Deutsche Bahn: Düsseldorf to London / London to Düsseldorf. Eurolines and Flixbus also have bus service between Düsseldorf and Antwerpen or Düsseldorf and London. Try to avoid journeys requiring a bus change. The deals on Megabus buses – bookable via Flixbus – from London to Germany are often spectacularly cheap. Düsseldorf has excellent further long-distance bus and train connections with other cities in Germany.